So, someone has put you in charge of the wedding plans. Prepare yourself for a time of stress, fear, worry, and self-doubt; wedding planning is demanding and difficult. Yet, with grit and determination, the reward that your meticulous wedding planning will bring you is incredible. You’ll feel pride and joy when the wedding turns out to be absolutely perfect. And you’ll know it couldn’t have happened without your effort. Whether you’re a friend of the bride and groom, or the bride and groom yourself, it’s time to make a big impression with your wedding plans. Read on for some helpful tips and hints. It may seem a little odd to start with the little details, but if you want to make a big impression those little details are super important. Start by communicating with the bride and groom, and find out what they want from their wedding. Once they’ve got the big ideas and the theme across, take some time to get to know them more. What is their favorite song? Make a playlist and make sure the music is playing at appropriate times. What is their favorite food? Can their favorite food be implemented in some kind of wedding canopy selection? What do they secretly wish to have but feel may not be possible? For example, some couples may want their dog present at the wedding but may not mention it at the beginning because they worry about what others might think. Perhaps the bride and groom have a secret hobby you can discreetly emphasize through wedding decorations. Or maybe the couple secretly knows a lot about paleontology? You could hang dinosaur themed charms by the chairs or a nearby tree. What if the couple is crazy about Harry Potter? You could ensure that the invitations promise a “magical evening.” Dig deep and don’t forget those details. Wedding plans make the biggest impression when they are well organized, but what makes an organized plan? Think log sheets, item and staff lists, budget spreadsheets and schedules. A good plan means that anyone could follow it themselves, should the need arise. If there are any aspects of the plan that doesn’t make sense to an outsider, it means you are being too vague on details and should go over them in more detail. Also be sure to have all the necessary contact details, just in case you need to supply them with a short notice request, or if there is an emergency. 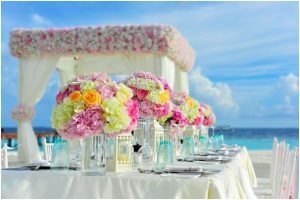 Search for the best wedding vendor service companies through our directory, and jot down all the contact details right now. Of course, you need to have wedding favors for guests at a wedding. Personalized wedding favors are charming and impressive, and guests are guaranteed to appreciate the effort and thought that has gone into them. Here are some ideas on how to treat your wedding guests. You could consider attempting to ‘spread the romance’ towards guests by purchasing some personalized candle tins for guests to take home after the wedding, which they could use to make their own special night once they get home. Not only should the guests be spoiled, it is super important to spoil the bride and groom at their wedding too. By researching those little details, you should already have an idea on what would delight them. Go an extra step further and take a look at purchasing a spa day for both the bride and groom and their best friends. A good day at the spa eases any stress or anxiety they may have been developing towards the days leading up to their wedding day, and they’ll be feeling beautiful and handsome with the spa treatment. For more ideas take a look on how you can spoil your bride to be. Contributor: Hollie is a freelance writer and co-writer for the Hollie and the Ivy blog. Hollie loves all things wedding and enjoys sharing her tips to wedding planners and newlyweds-to-be. She is also passionate about upcycling, interior design and crafts, and travels in her spare time.